Ode To Mercy is an imperial brown ale combining the flavor and aroma of deep roasted malts, oak and coffee specially blended by Athens, GA’s 1000 Faces Coffee, yielding a smooth, creamy finish. Bottles will be available by the end of the year. Wow, what a nice beer; with rich dark malt flavors with coffee and a note of chocolate. This is rich with a silky smooth mouthfeel. This is like a chocolate coffee Dubbel with American yeast. This was delicious to the last warm drop. 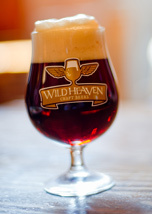 This beer was served at the bar in its own tulip style glass. I nursed it as long as I could and used the bowl of the class to warm the ale with my hand. It was just amazing. The warmer I got it the better it tasted; smooth and rich with a silky smooth mouthfeel to the last warm drop. This truly was the best beer that I had in Atlanta. I just hope that they can distribute this to us Yankees. For a really cool bonus the bar tender let me keep the glass and I got it home safely. A+ | Ode to Mercy is the most original American Brown Ale that I have ever had. What a treat finding this in Atlanta. This exquisite ale is full of the most rich dark roasted malt flavors followed by a natural real roasted coffee flavor and finishing notes of toffee and chocolate with the most delectable silky smooth mouthfeel. This Georgia Gem was delicious to the last warm drop.